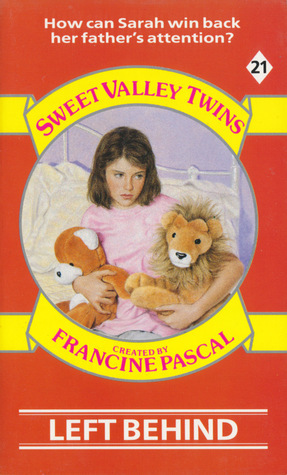 Babysitting in Sweet Valley: Review #2 - Sweet Valley Twins #21 - Left behind by Francine Pascal or Seriously Francine,a gold digger? Review #2 - Sweet Valley Twins #21 - Left behind by Francine Pascal or Seriously Francine,a gold digger? I know there was never a currently reading post for this but that's because I read this in one sitting on Saturday so I didn't really see the point in doing one. My next post probably won't be until the weekend because I'm working my way through my modern books at the moment and taking a break from Nightmare Hall. But you're in luck because my Saturday post will probably be a Book Haul because I'm going to one of my best towns for 80's and 90's books. Expect a lot more posts soon though because on Friday, half-term break commences. In my opinion this is one of the weakest Sweet Valley books I've read because it was more focused on Elizabeth's friend Sarah than the actual twins. However that doesn't mean that it didn't have enough drama to outshine any daytime soap. First let me introduce you to our main character (I won't bother introducing you to the usual characters) Sarah and her train-wreck of a family. Sarah is a member of Elizabeth's posse and has recently been suffering problems at home due to her father's gold digger fiancé. The story starts with it's generic opening of the twins descriptions and extra-curriclars as if we needed reminding for the millionth time that the twins are more beautiful, Elizabeth's smarter and Jessica's wilder than we'll ever be. We then move on to the actual story with Elizabeth, Amy and Sarah discussing a history project and arrange to work on it at Sarah's sleepover the following Friday. Amy invites them both over for home-made brownies - *drools* - and Sarah mysteriously refuses ! Seriously Francine , who refuses brownies (except Stacey for medical reasons and Dawn because she's weird) ? Jessica then finally makes an appearance to complain that the Unicorn's featurette in The Sweet Valley Sixers was less than appeasing - as if they got a featurette anyway. Jessica rushes home as she remembers that the president of the Unicorn club (whose amazingly more annoying than Kristy) ,Janet, is coming to the Wakefield residence to discuss the plans for the Unicorns latest party so she has to clean her room in order to impress her - because that's a totally normal thing to do. Anyway Janet comes over and asks about Steven - unobvious to Jessica because she has a crush on him - but he's not there so they continue with their planning while eating cookies. Seriously Francine are you trying to make them obese (and me) ? The perfect idea of a luau - Seriously Francine, what ? - and they decide to have the Hawaiian party in Jessica's yard because it has palm trees - I thought there was palm trees like everywhere in California ? The next day the twins go roller-skating - How 80's :D - Jessica invites Janet and Elizabeth invites Sarah who at first attempts to refuse. Seriously Francine , who wouldn't want to skate with the Wakefield's ? Meanwhile Janet asks Jessica about Steven again but of course he's too macho to hang with his little sisters and is playing basketball. Janet decides it's time for refreshments - nacho's and cherry cola (Seriously Francine, can you hear my stomach grumbling ?) - and they bump into Bruce Patman. Do I hence foreshadowing , Francine ? As soon as Daddy dear returns though Annie clears up any evidence of her lounging - speechlessness annoyance ensues - and a harsh reality slaps Sarah cold. Her father is going on a business trip for a week therefore she and Annie will have a week alone together. Seriously Francine , does the poor girl deserve such torture ? Automatically after Sarah's father leaves Annie receives a phone call summoning her to a town faraway from Sweet Valley for a week! Sounds like a win win situation right ? Well imagine being alone in house for an entire week at age 12. Sound like my worst nightmare personally. When Sarah gets home she gets a call from her inquisitive Aunt Lillian but she dismisses all comments of unhappiness. The seemingly endless evenings of restlessness continue and everyone is become more concerned especially Elizabeth but Sarah's too afraid to admit the truth. Jessica finally finds out about Janet's unrequited love and loses it - The argument even ends up with Jessica threatening to leave the Unicorns ! I haven't been so shocked since Mallory went on strike. Fortunately this is quickly resolved. Sarah's returned home from school on Friday when she hears a noise from downstairs and does the 'logical' thing of running downstairs to see if there's a burglar. This is when she stumbles, her head colliding with a banister and is knocked unconscious all because her school books fell on the floor. Elizabeth shows up at the house a few hours later to take Sarah to her sleepover but no one is answering the door. Peering through the window Elizabeth witnesses a horrible sight - no not Scott from All night long - Sarah looking dead ! Immediately Mr Wakefield jumps into Emergency mode - breaking through the glass to save her and finding her father's business card so he can come to rescue. Luckily Sarah's worst injuries were two broken twos plus a concussion. Sarah's father and Aunt Lillian turn up and they're bewildered to learn that Annie wasn't caring for her. Little Miss Guilty turns up and it turns out she's been lying about everything including the fact that she actually had no reason to leave Sarah ! Somebody tune the hospital radio to Kanye West's Gold digger. The book ends up with the twins learning that Sweet Valley Middle School has a new arrival - Ginny Lu (what a name !) from Texas - the star of the next book Out of Place. Disappointment then flooded through me - what about Jessica's legendary luau ? Seriously Francine you better include that in Out of place or there'll be trouble. At least it's only month till my birthday which I think is when I'll be receiving it. Damn you Sweet Valley cliff-hangers! If you've read Left Behind please share your opinion of it. For a second I thought you wrote Dawn was a weirdo. Annie was totally a gold-digger. No she just has a peculiar taste in food. I know.